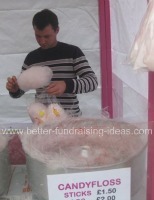 A cotton candy machine is a big investment for non profit organisations. But once paid for it can be a great little earner and a really popular and easy fundraiser. Cotton candy or candy floss as it is known in England was invented in 1904 and was first sold at The St Louis World Fair in the US. Since that time it has become a popular treat at fairs, fetes, circuses and every type of fundraising event. Cotton candy is simply sugar that has been heated and then spun very fast. There is no DIY option you need a proper cotton candy maker. This machine has a central head / bowl into which sugar (usually mixed with food colouring) is poured. The sugar is melted by little heaters near the rim of this central bowl and is spun out through special holes. As it meets the air it solidifies as fine filaments and collects at the edge of a larger outer catching bowl. The cotton candy is then collected from around the rim of the collecting bowl, usually being twisted onto a stick. There are a number of companies selling cotton candy machines and other cotton candy supplies. Prices and equipment vary so shop around to get a good deal. There are a lot of small machines intended for a bit of fun at home. These may be an inexpensive option but might prove a little slow for a serious fundraising operation. Professional cotton candy machines start at around £300 / $500. A serious investment perhaps, but once purchased the cotton candy supplies are extremely cheap and a cotton candy maker has serious fundraising potential. Think of the queues at the fairground stalls.The machine could also be shared by other fundraisers or hired out to other groups. Once paid for the profit potential is enormous. One 2kg bag of ordinary sugar will produce about 100 flosses. You do the sums!.......Now you're interested aren't you! Cotton candy is always popular at any fundraising event. It can however take a while to collect enough floss to fill a stick. Canny operators make up bags in advance which can be sold if orders start to stack up. It also means that bags can be bought and taken home. Its a fine and dandy, cotton candy recipe for success!